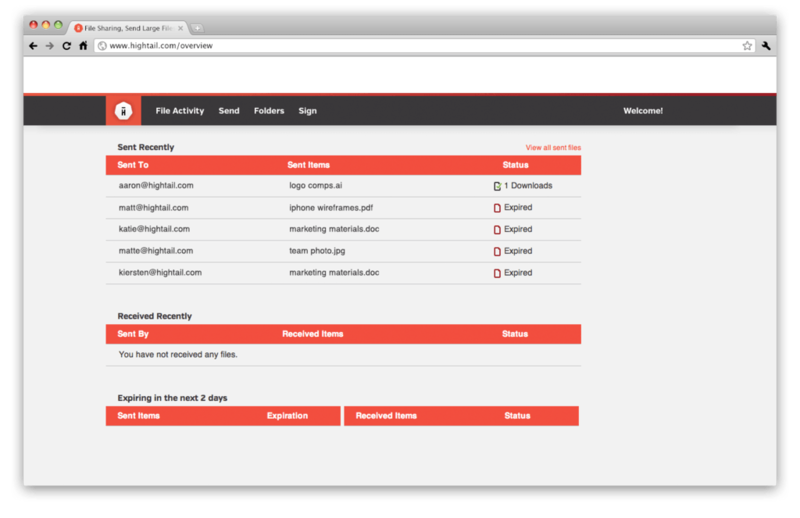 HighTail provides businesses with scalable cloud storage and file sharing solutions. The company’s enterprise-level cloud storage solution is ideal for large-scale businesses that need to frequently sync, share, and store large files. HighTail’s advanced encryption technology, user management controls, and reporting features provide large companies with a high level of security and functionality. HighTail’s services include secure file sharing, cloud storage, FTP replacement, and multiple team management functions for corporations. The company ensures security with a 128-bit SSL encryption during transfer and a 256-bit AES encryption in the cloud. Secure access via mobile devices is available through iPhone, iPad, Android, Windows Phone 8, and Samsung S-Pen. HighTail’s platform can be integrated with Microsoft Active Directory streamlining user management. The company’s user interface combines security and ease of use by incorporating single sign-on technology. HighTail differentiates its services by offering a unique Customer Success Program that provides ongoing support, training, and account evaluation to ensure businesses receive maximum benefit from its product. Large businesses benefit from HighTail’s comprehensive reporting, analysis, and corporate policy management features. HighTail’s cloud storage and file sharing solution is suited for large businesses looking to enhance security, maximize productivity, and encourage collaboration from any device. One of HighTail’s earlier customers, the United States Golf Association (USGA), implemented cloud-based services to improve the sharing and access of creative files while maintaining security. As a result of working with HighTail, USGA was able to streamline communication and increase productivity with improved access to content across multiple devices. Learn everything you need to know about HighTail. Our experts will reach out to you shortly.